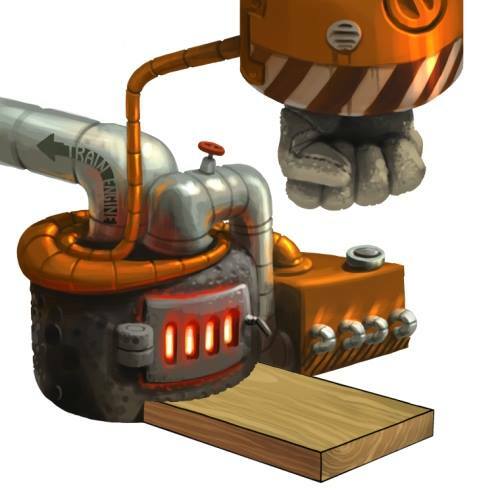 The Engine Doubler is a Law weapon designed to be used in the Daredevil Canyon phase at the Gnawnian Express Station. The fire-powered fist propels itself toward the mice below and is especially effective against Fueler mice. It uses leftover steam from the train's engine to power itself, but what it draws in power from the engine it more than makes up for in its effectiveness. Worry not, it won't hinder the train's speed in any way! Using this trap will help hunters catch more of the Fueler mice and collect more Fuel Nuggets, powering the train's engine to great speeds! This trap is very effective while the Gnawnian Express is approaching Daredevil Canyon. The Engine Doubler can be purchased in the Gnawnian Express Station Trapsmith for 150,000 gold, 100 Iron Pellets, 200 Copper Beads, and 300 Tin Scraps. It cannot be refunded. The Engine Doubler provides an additional 1500 power in the Daredevil Canyon phase at the Gnawnian Express Station. Supply Grabber - Provides an additional 1500 power in the Supply Depot phase at the Gnawnian Express Station. Dusty Coal Charm - Attracts Coal Shoveller Mouse in the Daredevil Canyon phase of the Gnawnian Express Station. Magmatic Crystal Charm - Attracts the Magmatic Crystal Thief and Magmatic Golem mice in the Daredevil Canyon phase of the Gnawnian Express Station. 26 September 2013: The Engine Doubler was introduced with the release of the Gnawnian Express Station location.